Picture logic fans will love these colorful multi-layered puzzles. In each puzzle a photo has been separated into several color layers. Each layer contains number clues. Follow the clues to reconstruct the photo. FREE DOWNLOAD. 27 free puzzles in two Intro puzzle packs - many more puzzle packs available. 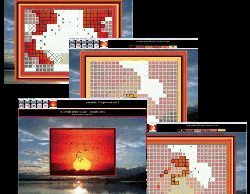 Solve multi-layer puzzles using minesweeper logic with a twist to find the color-layered photo. Simple rules - all you need to know is how to count to 9. PrismaPix for Windows PC includes 1525 gorgeous picture-puzzles, each with 3 difficulty levels, for a total of 4575 different puzzles. Fun famiy entertainment!